Hosted by GFC Media Group, the prestigious Mining & Investment Latin America Summit, exclusively designed to connect mining companies with financiers and investors, returns on October 29th and 30th 2018 to the Westin Hotel, Lima, Peru. Latin America continues to develop as a prime location for mining investment, exploration and expansion. Attracting one third of the world’s mining investment, the continent continues to yield sources of iron ore, copper and gold, as well as silver, zinc, niobium, rhenium, molybdenum and lithium. Such plentiful natural resources generate considerable revenue and are a powerful driver for regional and national economic development. The potential for investment in Latin America mining is well known by investors and bankers alike, who are looking to be well positioned for 2019. 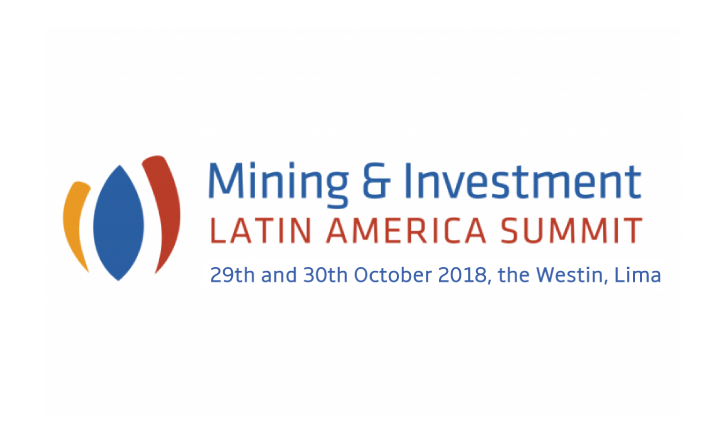 The Mining & Investment Latin America Summit 2018 plays a crucial role in mapping out the Latin American opportunities and challenges; in the provision of constructive expert industry outlooks for 2019; and in promoting the industry’s continual development by connecting key industry decision-makers with willing counterparties, thus instigating vital business deals. The summit is the only event in the region to focus on bringing together mining companies of all sizes with investors and financiers. This year, gain fresh insights from over 60 expert speakers and take away new business solutions and contacts, as the mining industry continues to recover. A growing list of reputable sponsors support the Mining & Investment Latin America Summit 2018, including: Alianza Minerals, Americas Potash, Auryn Mining, BNP Paribas, CIBC, Coro Mining Corp, Dark Horse Resources, Dentons, Fitch Ratings, HSBC, ING, M3 Engineering & Technology, Mayer Brown, Natixis, Osler, Hoskin & Harcourt, Palaminia Corp, Panoro Minerals, PPX Mining Corp, Shearman & Sterling, Sol Gold, Tartisan Resources, Tinka Resources, Winston & Strawn, Zinc One. GFC Media Group is recognised as one of the leading producers of financial conferences, online market intelligence platforms and awards, which in turn facilitates idea-sharing and networking between corporates, SMEs, government entities, advisors, regulators, bankers and funds. At GFC Media Group our aim is to improve connectivity between companies looking to raise capital and investors seeking to deploy it.